Whoops! I just realised that I haven’t actually posted a single blog yet – how remiss of me! I guess I’ve just been too busy creating new patterns and items for sale, for all my lovely customers out there. But you deserve to hear from me every now and then, so here goes. January was, in fact, a very busy month. 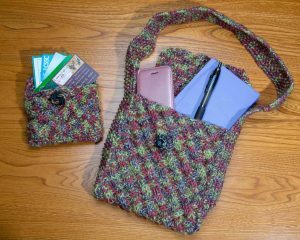 I set myself a goal to create five new patterns – design, make, photograph, and write the patterns, check them carefully, and then turn the Word documents into PDFs and upload them to the three places where my customers can find them – here on my website, on Love Knitting, and on Etsy. Well, nearly achieved it. I got them all prepared, and managed to upload to the first two, although I had to re-upload to the Love Knitting site, and they should be available there soon. Then technology let me down, and our internet wasn’t working for the last few days of the month, so I couldn’t add them to my website. Then February happened, and it still didn’t get done … for which I apologise. 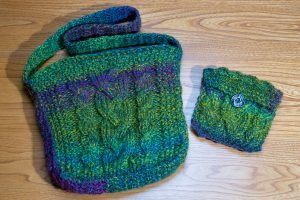 I now have available new patterns for a cowl, hat and headband, and purse and handbag in a symmetrical criss-cross pattern, and a handbag and purse to go with the original Winter Warmer Set, with a plaited centre and twists to the sides. Right now, I’m in two minds about whether to get a ticket for the Knitting and Stitching Show at Olympia next month. It’s not that I don’t know if I’d enjoy it – I’m sure I would – but my yarn stash is big enough already, andI just know I’d have to tie my hands behind my back to stop myself spending a lot of money and bringing home an entire roomful! I do think I’d get a lot of inspiration as well, though, so I suspect it would be worth the itchy fingers. So watch this space – March could be another month of frantic knitting, designing and uploading!